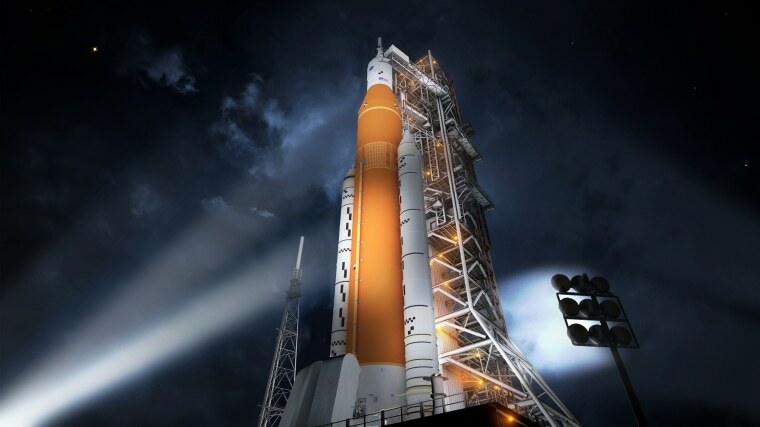 The SLS program is managed by NASA's Marshall Space Flight Center in Huntsville, Alabama. The rocket’s prime contractor, Boeing, operates out of NASA's Michoud Assembly Facility, 10 miles from New Orleans. SLS rocket engines are tested at Stennis Space Center, 40 minutes away in a Mississippi swamp. Bush’s promise led to the Constellation program, which included an effort to build an Apollo-style crew capsule named Orion that would be launched on a rocket named Ares I. Additionally, NASA would build a giant cargo rocket called Ares V to send lunar landers, crew habitats and other hardware to the moon. And it didn’t last. President Barack Obama canceled Constellation in 2010 after it fell behind schedule and went over budget. The move sparked outrage among some members of Congress, including then-Sen. Kay Bailey Hutchison, R-Texas, then-Sen. Bill Nelson, D-Fla., and Sen. Richard Shelby, R-Ala., then a member and now chair of the powerful Senate Appropriations Committee, which controls the federal budget. "Congress cannot and will not sit back and watch the reckless abandonment of sound principles, a proven track record, a steady path to success and the destruction of our human space flight program,” Shelby said at the time. Problems such as these are to be expected with a major initiative like the SLS. But in a 2018 report, NASA’s Office of Inspector General blamed the agency and Boeing for sloppy expenditure tracking, questionable performance reviews that awarded Boeing millions of extra dollars and the granting of contract extensions without proper oversight. Critics have said that NASA should buy, not build, its big rockets from companies like SpaceX using these "fixed price" contracts. One possibility is SpaceX’s beefy Falcon Heavy rocket, which the company’s CEO, Elon Musk, announced in 2011 and which took its maiden flight in 2018. NASA could soon have even more options for sending astronauts and cargo to the moon. Jeff Bezos' Kent, Washington-based Blue Origin is working on a rocket called New Glenn that comes close to Falcon Heavy’s capabilities. And SpaceX is working on another rocket called Starship that would be more powerful than either Falcon Heavy or SLS. "As we continue to push farther into our solar system, we’ll need innovative new propulsion systems to get us there, including nuclear power," he said. "And the president and I know there’s no place on Earth better equipped to lead the world in pioneering these new propulsion technologies than Rocket City, U.S.A.," invoking Huntsville’s self-proclaimed nickname. "We're like a cycling team, and the government should be running point and making it easier for our companies to be productive behind us," she said. "If one of them comes up alongside us and they're better at something than us, we don’t take our air pump and jam it in their spokes — we take the next hill."